TOURS ARE SCHEDULED FROM 2 HOURS UP TO 4 HOURS BY RESERVATIONS ONLY. THE RATE IS BY THE HOUR NOT PER PERSON. EACH TOUR IS LIMITED UP TO 6 PASSENGERS PER GROUP. Depending on the length of the tour many points of interests are covered along the south, west, east and north shores. During our tours guests have the opportunity to stop along the way to swim in the lake and do water sports or just sit back and enjoy the scenic sights. 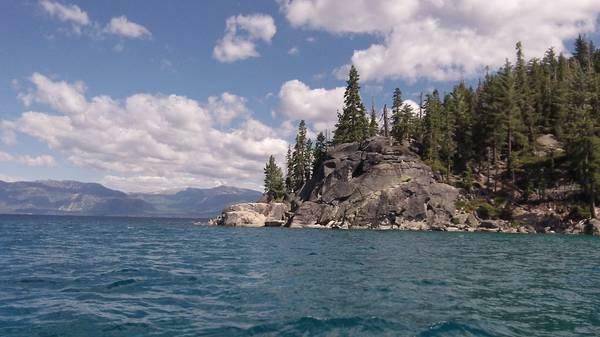 Our popular three hour tour will go from the Tahoe Keys Marina into Emerald Bay to view the historic Vikingsholm Estate and Fannette Island. Then we cruise up into the Caribbean waters of Rubicon Bay and continue through Meeks Bay passing by Sugar Pine Point. Then to the Homewood area to view the Godfather Movie Estate. From there we can go across to Cave Rock and along the east shore passing by Zephyr Cove and the Stateline area. Our boat is given the Seal of Safety by the United States Coast Guard each season. Life jackets are provided for all ages and sizes. Children 12 years and under are required to wear personal flotation devices at all times aboard the boat. 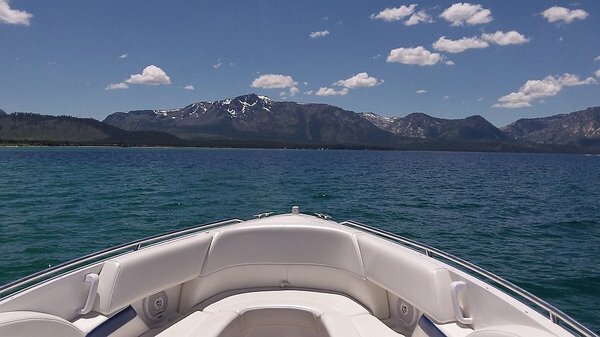 Our Captain is licensed by the United States Coast Guard and has over 25+ years on Lake Tahoe. Tours are scheduled either in AM or PM weather permitting. The Captain will determine if weather or winds will limit the areas of the tours during the day. EACH TOUR IS LIMITED UP TO 6 PASSENGERS PER PRIVATE GROUP! Our tours are planned along a course of landmarks, lakefront estates and scenic sights, but we are flexible based on the interests of our guests. Depending on the length of your tour. We provide unloading for guests to visit Camp Richardson, Vikingsholm Estate, Chambers Landing and Sunnyside. Or just sit back and experience the scenic sights and secret locations from Emerald Bay to Sand Harbor. We provide an ice chest and cooler with ice, bottled water and sodas. All you need is your camera, sunscreen, snacks or a packed lunch and beverages of your choice. Alcohol is allowed. Spectacular Tahoe sunsets are the perfect backdrop. A wonderful time to explore Emerald Bay is in the evening allowing exclusive access to the park after hours. Your captain will secure the vessel and take you on a private walking tour around the historic "Vikingsholm" property. Where you will hear the amazing tales of the original owner Mrs. Lora Knight. 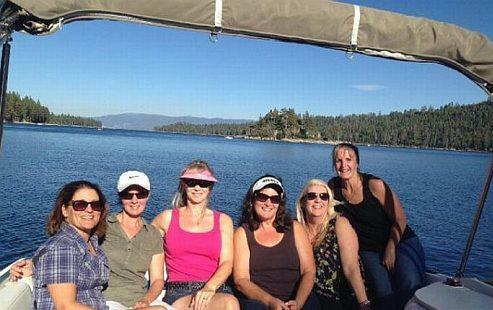 After visting Emerald Bay we go up the west shore into Rubicon Bay, then across the lake and back to the Marina. 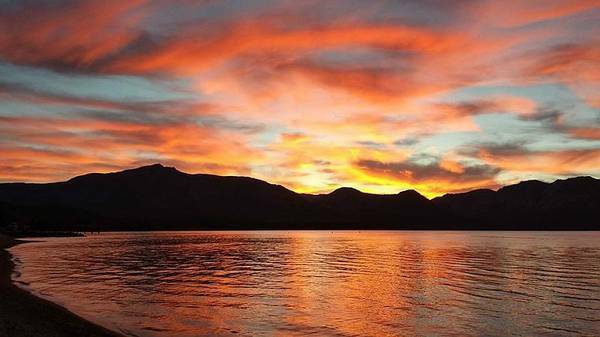 During summer operations we schedule sunset cruises from 6-8pm and in the fall 4-6pm.